We are pleased to announce a much requested feature, entire event and gallery downloads. Your clients can now download all the images in an event or in a gallery. The download can either be free or paid. To set free downloads, open the Event level sharing section in the event's settings page, and move the downloads slider to the unlimited setting. To set up paid downloads, click on the Downloads tab in your pricelist and add a price to either the Complete event download or Complete gallery download products shown. In either case, the download will be accessed from the new Downloads menu link that will appear in the event's nav bar. If a client is downloading a Free download, the user will be prompted to enter in their email address and then a zip file will be created and downloaded automatically. 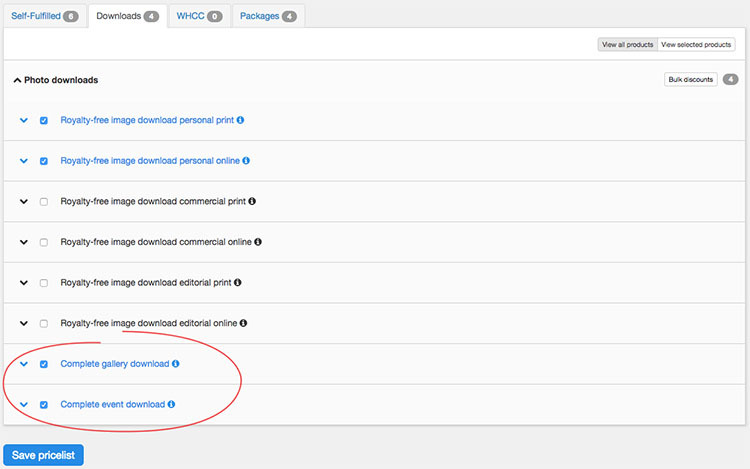 If a client is downloading a Paid download, the download will be added to the user's cart. Once the order is placed, you will have the opportunity to re-upload retouched versions and then "release the downloads" when you are ready to fulfill the order. While you can offer both free and paid downloads in a single event, it may be preferable to choose one or the other so as not to confuse your customer. If you do choose to offer both, it is recommended that the free downloads be offered at a lower resolution that the paid ones. If your images are watermarked, free downloads will include the watermark, unless you set the download resolution to the Original setting, in which case we will deliver the image without a watermark.